We have introduced a new feature: Favorites. All normal locations will be added automatically to your favorite list. So you can see always your past journey and the next location. You can open your favorites with the yellow star button on the map screen. 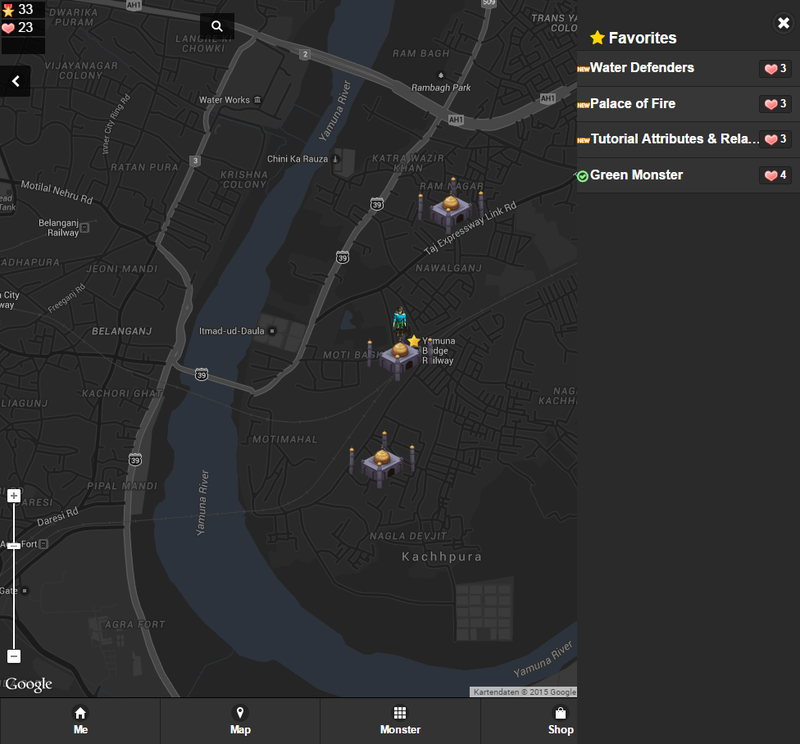 On the start page all new explored locations from your favorite list will be displayed. Hello again everybody! We hope you had a Happy New Year! We missed you all, so we wanted to make sure you got right back into the swing of things with a new Stream! As always, there’s are new locations to discover, with strategies and tactics to explore. We also have several important announcements and teasers regarding upcoming game adjustments. In order for your monsters to become stronger and use the full potential of their color power you must give them experience. They don’t earn experience during battles. They earn experience via Fusion (see screenshot below). While Fusion is key to building up monsters power, it can also be quite complex for a new player. So we’ve prepared this Fusion guide to help you understand the variables at play, and to start you down the path of maximizing your monster’s levels. 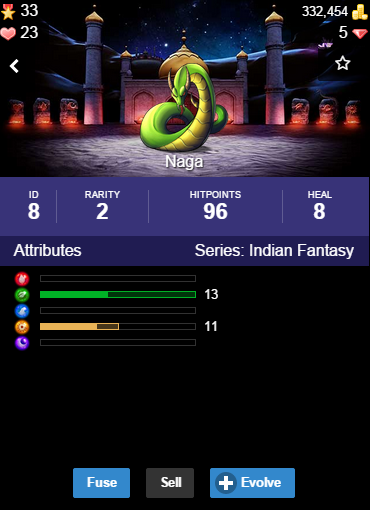 The 'Naga's green and light attributes have increased from 3 to 13 and from 2 to 11. Also take a look at the hitpoints, they have also massively increased. One is the attribute color. If the base monster and the monster to be fused share the same attribute colors (e.g. red, green, blue, light,dark), you’ll get a 50% boost to the experience gain in Power-Up Fusion. If an attribute color is not available in the base monster the experience will be added to the strongest color of your base monster. The highter the level of your base monster, the more gold is neede for fusion. Playa is a location based puzzle game, playable in all modern browsers. Playa combines the key elements of a puzzle game and a role playing adventure on a real world map. Players build and command a team of monsters as they explore the world, play puzzle games at locations and battle mighty foes. 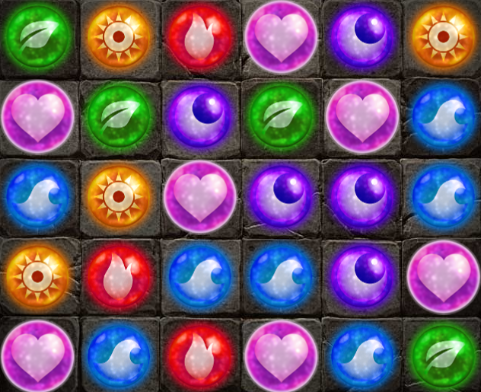 Slide glowing orbs across the board activate your monsters to attack. Puzzle Game: Use the power of the five colors. 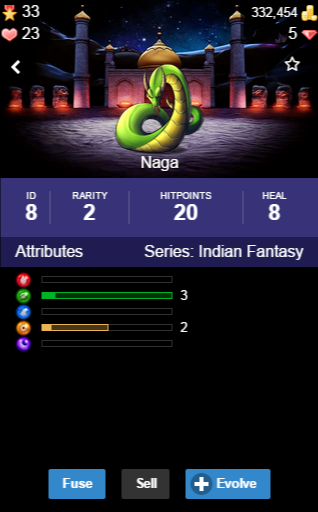 When matching three same colored glowing orbs (red, green, blue, light, dark) in a row or column, the matching monster in the team will attack the enemies. Match five for an area attack and multiple combos for massive damage. But be aware – your enemies will also activated by colors. Plan your moves carefully! Collect and level-up Monsters: Find and defeat mighty monsters and collect them. 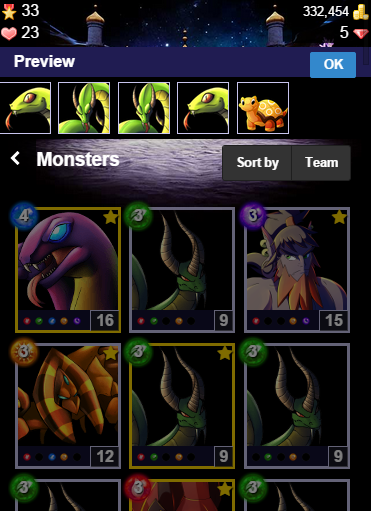 Build a winning team by leveling up your monsters through fusion and evolution. 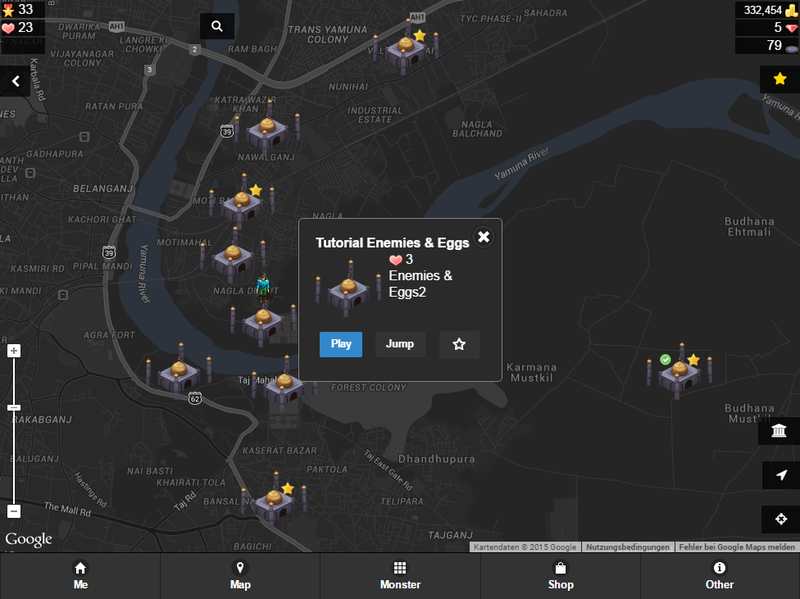 Play at real locations: Explore the map and discover locations. This augmented or virtual gameplay allow for playing at real locations or just walking around and discover new places. Build your palace at your home place and let friends play against your team. The whole world awaits you! The whole world awaits you! We hope you are enjoying this holiday season with friends, family, fun, and (most importantly) games! Check out our new teleport feature and enjoy the new functionality. A teleport lets you jump to any location on the world map regardless of your own position. As long as you have teleports, you can use this feature. A new milestone is done! Finally there is a new version of Playa alpha available. Playa comes with ten bosses on a fantasy world. Well, some time of development have added a fair bit of material. The game is still in an early state but you can play it in all modern browsers including smartphones.We recommend using chrome for best performance experiences. Check out our feedback system and leave comments. Copyright Playa.cc 2015. Simple theme. Powered by Blogger.